James B. Abbott, as secretary of the 10th district committee of the Free State party, prepared this broadside to advertise a meeting to nominate two Senators and seven Representatives for the Legislature. Abbott wrote that the district included the following precincts: "Fish's Hotel, Palmyra, Blanton, Willow Springs, Franklin, Lawrence, and Benicia." 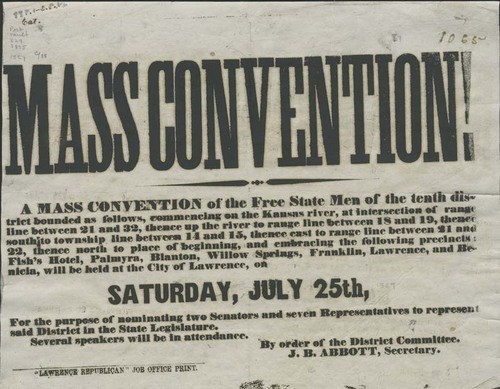 The meeting was to be held in Lawrence on July 25, 1857.